Parade Rest. The command is Parade, REST. 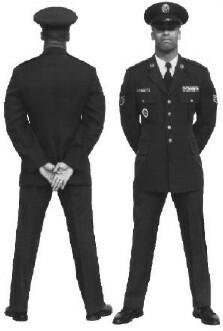 On the command REST, the airman will raise the left foot from the hip just enough to clear the ground and move it smartly to the left so the heels are 12 inches apart, as measured from the inside of the heels. Keep the legs straight, but not stiff, and the heels on line. As the left foot moves, bring the arms, fully extended, to the back of the body, uncupping the hands in the process; and extend and join the fingers, pointing them toward the ground. The palms will face outwards. Place the right hand in the palm of the left, right thumb over the left to form an "X" Keep head and eyes straight ahead, and remain silent and immobile. At Ease. The command is AT EASE. On the command AT EASE, airmen may relax in a standing position, but they must keep the right foot in place. Their position in the formation will not change, and silence will be maintained. Rest. The command is REST. On the command REST, the same requirements for at ease apply, but moderate speech is permitted. Fall Out. The command is FALL OUT. the immediate area, and no specific method of dispersal is required. Moderate speech is permitted. To resume the position of attention from any of the rests (except fall out), the command is (for example) Flight, ATTENTION. 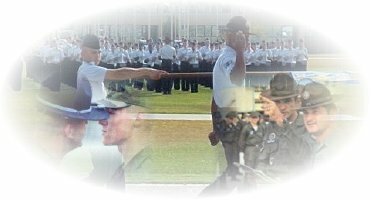 On the command Flight,the airman assume the position of parade rest: and at the command ATTENTION, they assume the position of attention.